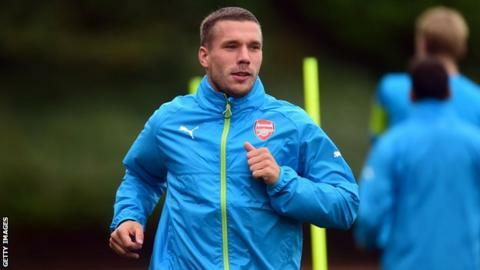 Arsenal boss Arsene Wenger says that forward Lukas Podolski will not be sold during the current transfer window. The German international, 29, has been linked with a move away from the club this summer, with Juventus and Galatasaray both reportedly interested. Wenger has included the player in his squad for Wednesday's Champions League qualifying tie against Besiktas at the Emirates - the first leg finished 0-0. "Podolski is in the squad for Wednesday and will stay with us," said Wenger. Podolski, who was a member of the Germany squad who won the World Cup in Brazil this summer, has yet to make an appearance for the Gunners this season. However, an injury to Olivier Giroud, who could be out for up to three months after damaging his ankle in the 2-2 draw against Everton on Saturday, leaves Podolski as one of four fit forwards at the club along with Alexis Sanchez, Joel Campbell and Yaya Sanogo. Wenger is adamant that the team can continue to perform without Giroud and is confident they can get a positive result against Turkish side Besiktas to reach the group stages of Europe's premier club competition for a 17th consecutive season. "For us the Champions League is very important. We want to play at the top level, at international level," added Wenger. "It's a very important game, more on the sporting side than the financial side. "Nothing is unthinkable - it (not qualifying for the group stage) has happened to 99% of all the big clubs in Europe. "But we want to be in there and we think we have the potential to do it. The task is clear and we know we can do it. So let's do it. "Experience plays a big part. We have big experience of playing in the Champions League and in highly pressurised games. We can use that. "But what's more important is putting in a good, strong performance. "I'm confident this group is mentally prepared and ready for the fight."